The best way to use Twilio for Salesforce on a mobile device is through the Salesforce 1 mobile app. Salesforce 1 is a free application created by Salesforce that allows users to access your organization from a smartphone. 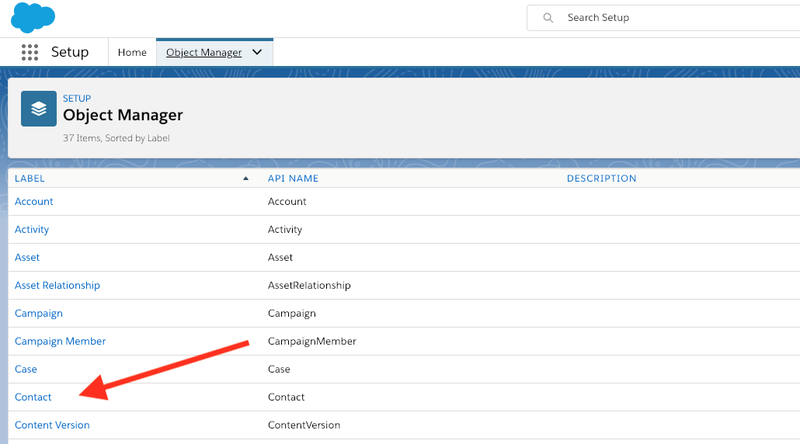 In the Salesforce 1 mobile app, objects such as contacts, leads, and person accounts do not support embedded lightning components. 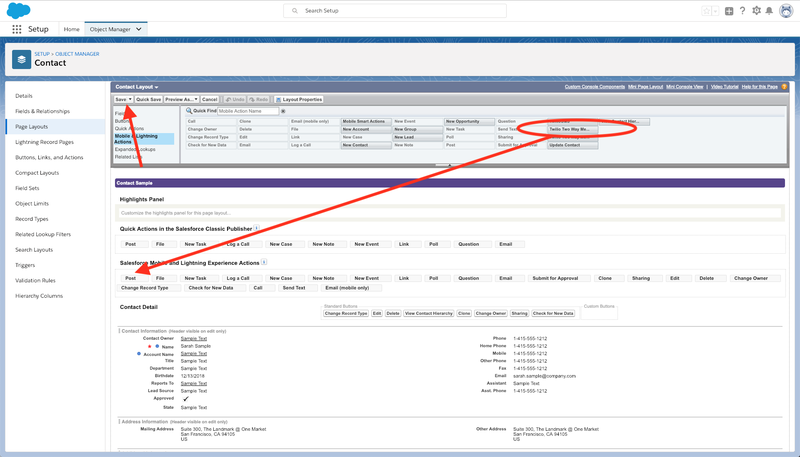 In place of lightning components, Twilio for Salesforce uses quick actions to display the 1:1 messaging interface. 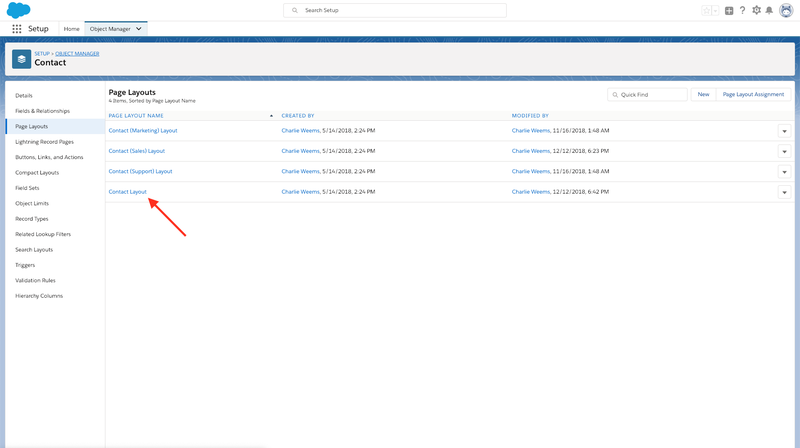 The following steps are based on this Salesforce Trailhead, which provides additional useful information about configuring quick actions. 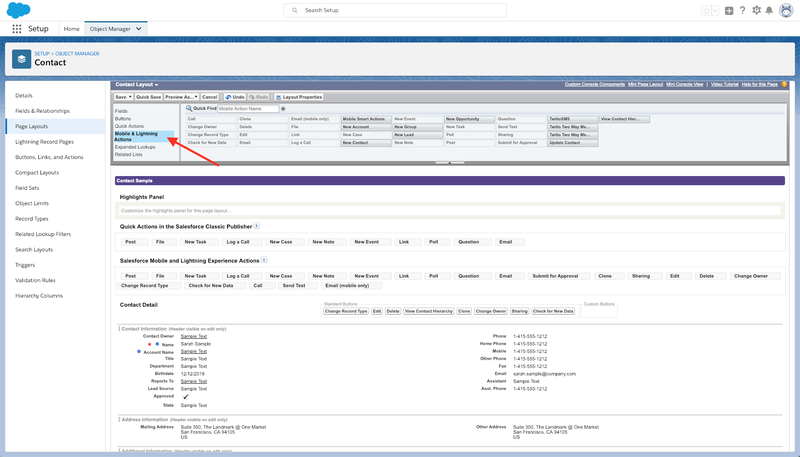 Note that you will configure the Twilio SMS quick action on your desktop version of Salesforce, not the Salesforce 1 mobile app. 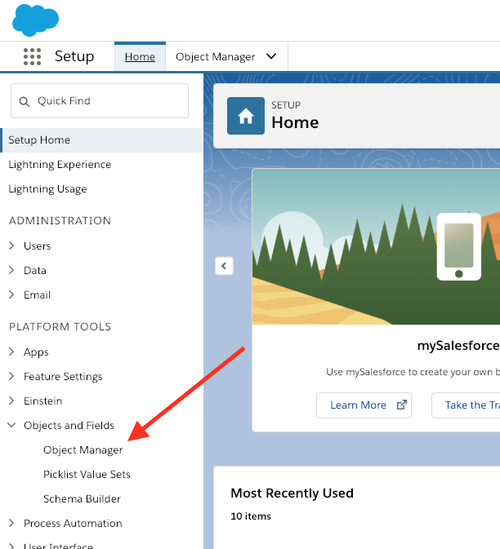 Step 1: Click on "Object Manager" in the Salesforce setup panel. Step 2: Select the object that you wish to add the Twilio SMS quick action to. In this case we'll be adding to the contacts object, but you could also add the quick action to a lead, person account, or case. Step 3: Under "Page Layouts" click on "Contact Layout". Step 4: Click on "Mobile and Lightning Actions" in the page layout builder. Step 5: Drag the Twilio SMS item into the "Salesforce Mobile and Lightning Experience" section. Then click “Save”. Step 6: Refresh your mobile app, and you should see the Quick Action at the bottom of the page when viewing the contact.